There is an attraction between the negative electrons and the positive protons. 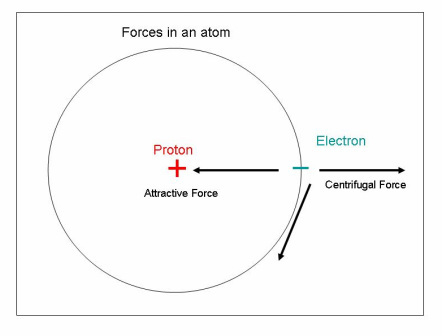 The attractive force and the centrifugal forces cause the electrons to orbit the nucleus or protons in the center. This is illustrated in the drawing to the left. 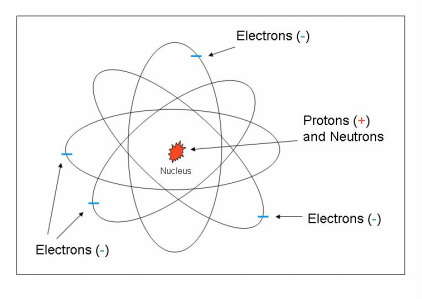 The number of electrons in all orbits and the number of protons in the nucleus will try to remain equal. If they are equal, the atom is said to be balanced or neutral. 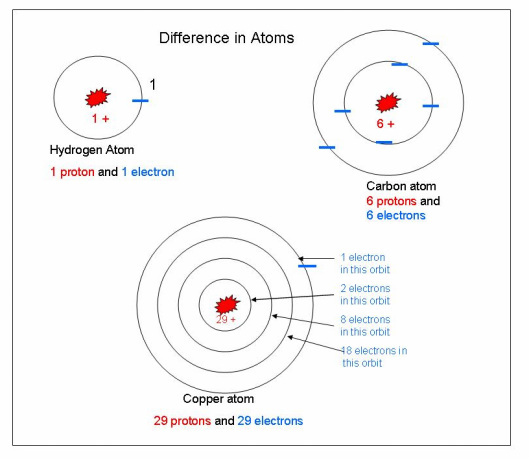 The illustration to the left shows several atoms with the number of protons and electrons shown for comparison. The Hydrogen atom has only 1 proton and 1 electron in the atom. Carbon has 6 protons and 6 electrons in the atom. Copper has 29 protons and 29 electrons in the atom. When studying electricity the electrons in the outer orbit are the only ones we need to study. The outer orbit of the atom is called the valence ring. It holds the outer most electrons. Electrons in the valence ring can easily be added or removed. The copper atom to the left has only 1 electron in its valence ring. Also, an atom with several electrons missing will try to gain or capture other electrons in order to balance itself. If an atom has an excess amount of electrons in the valence ring, it is said to be negatively charged and will try to get rid of these electrons. This will also help balance the atom. --A material with three or fewer electrons in the outer orbit is called a good conductor. --A material with five or more electrons in the outer orbit is called a good insulator. --A material with only four electrons in the outer orbit is called a semiconductor. Materials that have only four electrons in the outer orbit can be either a conductor or an insulator, depending upon what is done to it in the circuit. These materials are called semiconductors. They are used in computer circuits with components such as transistors, diodes, Zener diodes, etc. Relationship to Street Rods: There are many electrical circuits in a typical street rod. These circuits use mostly copper wire (or other good conductor materials) to move the electrons around the circuit. Copper wire is a good conductor. It only has one electron in the outer orbit so it can be moved easily. In an electrical circuit, the electricity that is flowing is actually the electrons moving from one atom to another. These electrons move at the speed of light or 186,000 miles per second. When you see a spark plug fire or a spark between the battery and a wire, you are actually seeing millions and millions of electrons jumping across the open circuit.